Tickets available here beginning 4/17 at 9 a.m.
Every year the Town of Kiawah Island Arts and Cultural Events Council, in collaboration with the City of Charleston Office of Cultural Affairs, provides a preview of the Piccolo Spoleto Festival, which is Charleston’s contribution to Spoleto Festival USA. This year the 41st Piccolo Spoleto Festival will present more than 500 performing, literary and visual arts events. 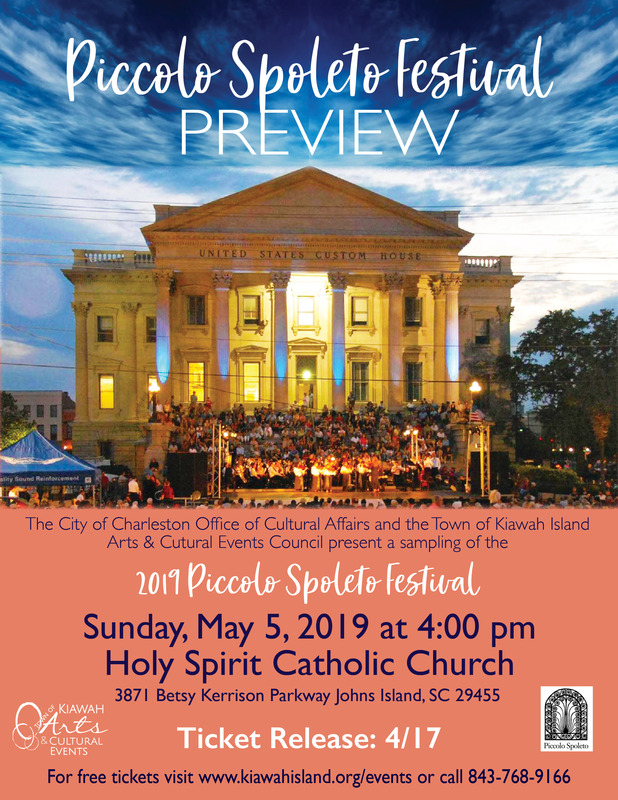 Join us on May 5 at Holy Spirit Catholic Church for a preview of Piccolo Spoleto and receive your copy of the Piccolo Spoleto program. Our Piccolo Preview will feature performances by three of Charleston’s finest musical groups. Katie Small and the small opera company will start off the concert with selections from their repertoire of the classic operas of Bizet, Puccini and Mozart. The small opera company produces opera on a small scale but with big voices. The small opera company will be followed by the Oscar Rivers Quartet. Oscar is a master of both the piano and the saxophone and has been a mainstay of the Charleston jazz scene for decades. This delightful afternoon will conclude with music from The Charlestones, a quartet whose a cappella music ranges from Renaissance to Broadway, spirituals to country, and jazz to pop.